The Minister of Finance said that over the next five years, the government plans to digitise over 100,000 villages. India has emerged as a world leader in the consumption of mobile data and now aims to widen its digital impact by reaching out to the country’s more remote and rural areas. Last week, the Minister of Finance said that over the next five years, the Government plans to turn 100,000 villages into digital villages. This will be achieved by expanding Common Service Centres (CSCs). The government will focus on artificial intelligence and transform the country into a hub for smartphone and electric vehicle manufacturing. The Minister said that the CSCs are developing more services and creating digital infrastructure in the villages, including connectivity, to convert the villages into digital villages. CSCs act as access points to deliver e-services provided by the central government, state governments and private players in rural villages. Some of these services include banking, education, health services, and passport and Aadhaar registration. They also provide access to online national services like booking train tickets and submitting forms and bills, etc. CSCs have adopted six villages where services, including WiFi hotspots, small manufacturing units, solar lighting facilities, LED assembling units, and sanitary napkin dispensers, are being set up to generate employment. Over 300,000 CSCs, employing around 1.2 million people are digitally delivering several services to Indian citizens. Mobile tariff, including data and voice calls, in India is now possibly the lowest in the world and the monthly consumption of mobile data has increased over 50 times in the last five years. The Make in India programme has made India a new destination for the mobile phone manufacturing industry. The programme was launched in September 2014 to encourage companies to domestically manufacture their products and increase their investment in the country. Mobile and parts manufacturing companies have increased from two to more than 268, which have made for huge job opportunities. According to the Minister, the Jan Dhan-Aadhaar-Mobile (JAM) and the Direct Benefit Transfer (a programme that transfers subsidies directly to the people through their bank accounts) are “game-changers”. He said that bank nationalisation was first done 50 years ago, but a large part of the country was still left out of the economic mainstream with no access to formal banking. Over the last few years, nearly 340 million Jan Dhan bank accounts have been opened. Aadhaar has ensured better-targeted subsidies. It has helped poor and middle-class citizens receive the benefits of government schemes directly in their bank accounts by eliminating middlemen. In 2017, the government launched the DigiGaon (Hindi for village) project. Its target was 700 digital villages by the end of 2018. It was created to connect villages to the Internet and assist residents with entrepreneurship opportunities. Over 100,000 village councils have been connected with optical fibre under the Digital India programme. 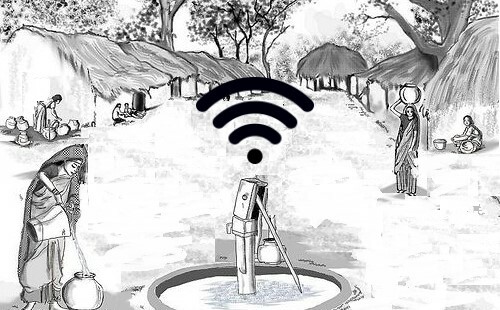 Around 40,000 village councils have also been provided with WiFi hotspots.